In the latest research by Compass, a firm specializing in automated reports and benchmarking tools, Bangalore has been declared as the Startup capital of India. With 3100 to 4900 active startups, Bangalore has received $2.25 billion of Venture capital funds in 2014, thereby outranking every other metropolis in India. Bangalore is the World’s 2nd fastest growing startup ecosystem, in terms of exit volume and VC inflow among all the top 20 global destinations for entrepreneurs. In terms of funding, $2.25 billion of capital inflow ranks it as 6th largest startup ecosystem globally. Overall, Bangalore is ranked as 15th biggest startup city in the whole world. The last time Compass did such a research for startup ecosystems was in 2012, when Bangalore was ranked 19th. Hence, in the last 3 years, the city has climbed 4 spots, which is yet another achievement. Special mention of Flipkart and InMobi occurred in the report, wherein they have been hailed as the leaders of $1 billion valuation ‘unicorn club’, which helped ‘recirculate the money’ within the ecosystem, and inspired other startups to think beyond their present status. The power of youth observed in Bangalore is another highlight of the report as the median age of startup founders is 28.5 years, which is 12% less than the regional average (inside India) and 21% below Silicon Valley’s average. However, the biggest obstacle to Bangalore’s incredible success story is the city’s inability to locate and nurture talents; as Human Resource failure is highlighted prominently in the report. In terms of finding cost-efficient talent, the city is ranked #17. The report also observes that the ‘quality of local talent’ available is not yet at par with other global ecosystems. Another disappointing factor is the engagement level vis-à-vis employees and employers in Bangalore. The report said that startups from Bangalore gave an average of 7% equity to their employees, which is 23% lower than global average. 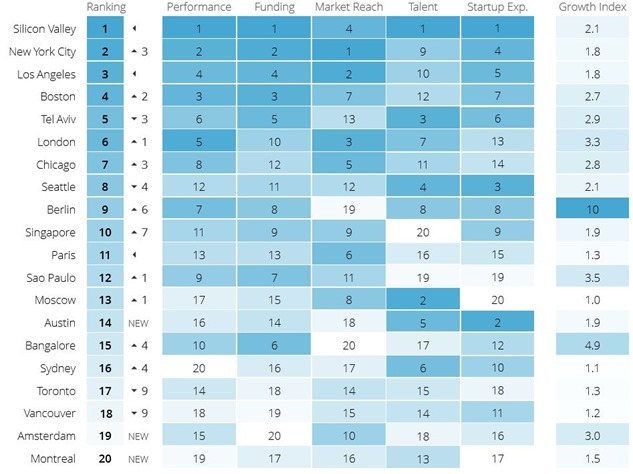 Overall, Silicon Valley (nick name of Southern part of San Francisco bay, California) is still the #1 startup ecosystem in the world with #1 ranking in VC funds inflow, talent acquisition, startup experience and more. New York City is at #2 rank with numero-uno position in market reach and Los Angeles is #3 biggest startup ecosystem in the world. Besides Bangalore, Singapore is the only Asian city in this top 20 rank, at #10. Tel Aviv at #5 is the only non-American city in the top 5 and there are total of 7 American cities in the top 20 list. Among European cities, only 3 managed to enter the elite top-20 list: London at #6; Berlin at #9; Paris at #11. Interestingly, there are 3 cities from Canada as well: Toronto at #17; Vancouver at #18 and Montreal at #20. "Bangalore Has Youngest Entrepreneurs In The World; Ranked 2nd Fastest Growing Startup Ecosystem", 5 out of 5 based on 3 ratings. Tandem Accelerator Comes to India; To fund 10-20 New Mobile Startups!